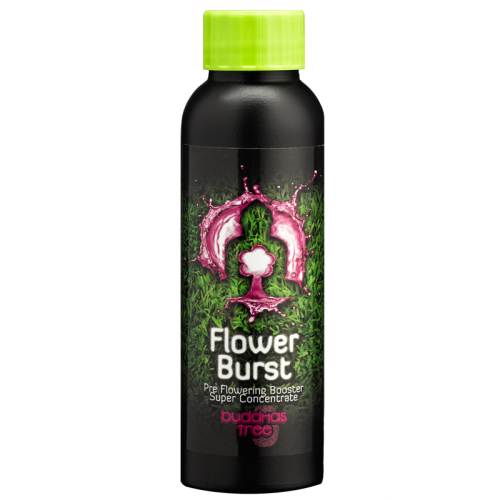 Buddhas Tree Flower Burst is a unique new product from Buddhas Tree that has been specifically created for use during your plants pre-flowering and early flowering stage. 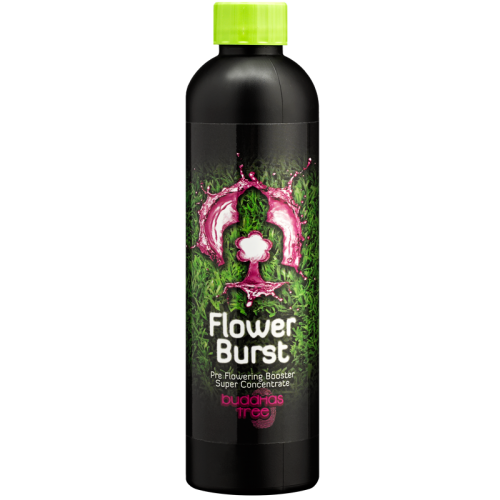 It promotes explosive flower set without hindering continuing vegetative growth, creates an increased number of flower sites and ensures a seamless change into the pure flowering phase of the bloom cycle in a way that more closely matches your plants needs. This results is a quicker and much more efficient flowering response. which is achieved in the kindest and safest way with a carefully composed blend that uses the same highest quality raw food safe materials that made our best selling PK 9-18 such a success. When the photoperiod is reduced to induce the flowering response, it may seem to some growers early on that it is the beginning of a dormant period for your plants whilst you wait patiently for flowers to appear. In reality, it begins an important transitional time for your plants, both externally and internally, where many changes will take place. 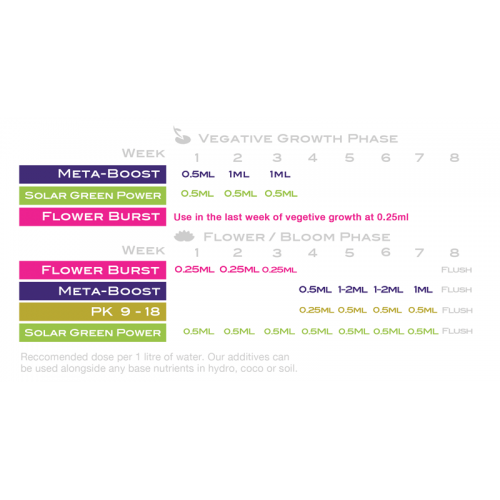 As we know, when these changes from vegetative to flowering growth occur, your plants nutritional needs also begin to change, hence why base nutrients are made with a separate `Grow` and `Bloom` formula to loosely reflect this changing demand. But when is the right time to change from one to the other? When it comes to the first few weeks of early flowering the plants are in a cross over phase where their needs are different from what it is possible to give them from just a single `Grow` or a `Bloom` base nutrient. During this time your plants are doing many things. They are still busy with vegetative growth above the ground, increasing secondary leaf production, building branches and increasing the amount of internodes that will eventually form the structure of your flowers and fruit. The leading element for healthy vegetative growth is Nitrogen and this is reflected in a `Grow` nutrients NPK ratio with high N ratio and low P (Phosphorus) and K (Potassium). This sudden increase in vegetative growth during the first weeks of pre-flowering is the reason that a lot of growers keep their plants on `Grow` nutrient for the first week or so of their bloom cycle, as they know that the Nitrogen content of a `Bloom` nutrient is often not enough to maximise the plants vegetative growth spurt at this time, But herein lies an issue. There are also huge, equally important changes happening below in the root zone that you cant see, where your plants are accelerating their production of roots so that they will be able to maximise nutrient uptake during the later most productive and demanding phase of the flowering cycle. The most important element in this phase of vigorous root growth is Phosphorus. So whilst a `Grow` nutrient ensures healthy and speedy above ground growth it hasn't the necessary Phosphorus type and amount to maximise the below ground root growth essential for maximum flower production. This is where Buddhas Tree Flower Burst excels. It provides your plants with the perfect transitional nutrient profile during this changing time so that your plants have access to everything they need to set flower as early as possible and fulfil their potential. 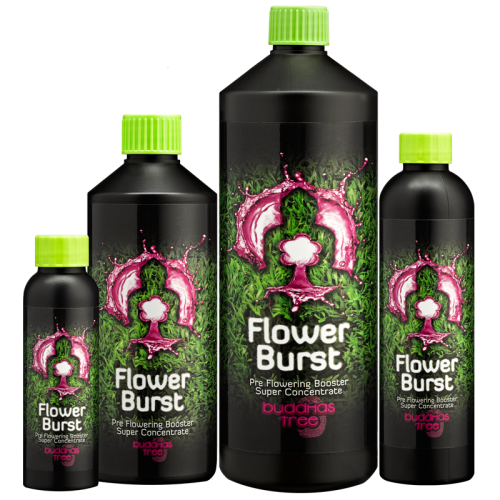 We have formulated our Flower Burst as a real value for money concentrate just like our PK 9-18 but with an NPK of 0-10-8 by weight. It also has increased Boron to aid Calcium mobilisation, an element also essential for maximum root growth. This ratio allows growers to use a `Grow` base nutrient during early flowering by increasing the type and amount of Phosphorus that your root zone and plants need to ensure the earliest possible onset of flowers whilst keeping the other elements balanced. There are some extremely high P products available to promote early flowering, however the levels of P and K used will be detrimental to other important growth processes that are happening. Buddhas Tree Flower Burst achieves this in a very kind way that will not overly stress your plants like other products. It has been made to conform to EU regulation and as everything else we do, is made with the highest standards of safety and quality. In trials Buddhas Tree Flower Burst induced a much quicker and more robust flowering response than control specimens. Flowers were recorded 4-5 days earlier than control plants with an increased amount of larger flower clusters. As with all our products, Buddhas Tree don't produce additives to make up numbers, we will only bring something to our growers that we know is an innovation and an improvement on anything currently available. You wont be disappointed...we guarantee it. Canadian Xpress Mighty Bloom Enhancer Canadian Xpress Mighty Bloom Enhancer quenches the cravi..